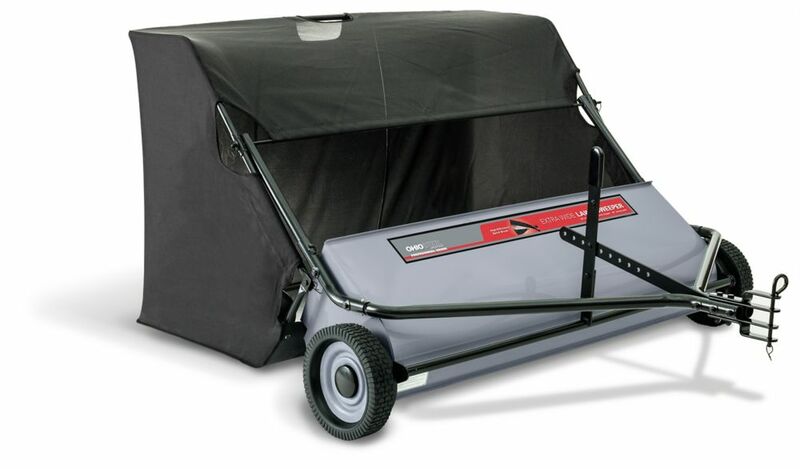 This Professional Grade Lawn Sweeper features an industry leading super capacity 26 cu. ft. heavy-duty collector bag and an extra wide 50 inch sweeping path allowing you to get your lawn care done faster than ever. Exclusive patented spiral brush sweeps more efficiently than standard sweepers and puts less stress on gears for longer life. No-slip positive lock height adjustment will not vibrate out of position and has easy to remember height settings. Hopper easily empties by pulling rope from the seat of your tractor. Just reverse to debris or compost area, pull the rope and you're done. Extra wide 9 inch chute is less likely to clog, especially when sweeping damp grass clippings that clump together. 3-position hitch adjustment allows for efficient level operation with any tractor hitch height without the use of easy to lose spacer rings. 11" spiraled polypropylene brushes  an Ohio Steel patented exclusive feature! Agri-Fab hauling carts are universal to any brand tractor or riding mower. Simply attach the included hitch pin to the rear hitch plate. This is the perfect tool for a variety of yard tasks like hauling dirt, gravel, sand, mulch or rock. All steel carts have tough powder coated finish and easy to use single lever dump levers for raising the cart bed for dumping. This 18-inch x 48-inch Polyethylene Lawn Roller from Brinly helps with multiple chores, from packing down newly sewn seed or sod to erasing damage from moles to frost heave. Special features include a heavy density polyethylene construction, all steel handle, and rounded end caps - to eliminate gouging on turns! If your lawn experiences moderate foot traffic or if you have heavy clay soil, you may need to aerate. Brinly's 40-inch tow-Behind Spike Aerator loosens soil and permit it's nutrients and water to reach roots. Our durable, heavy duty aerator features 10 galvanized steel stars that perforate the soil up to 2-inch deep. Each 8-inch dia. star rotates independently and continues revolving during tractor turns. The 14-Gauge steel, 110 lb. capacity weight tray allows for weight to be added for maximum penetration in hard soil. Brinly Hardy's heavy duty 850 lb. capacity, 17 cu. ft. utility cart is ideal for larger outdoor projects. Perfect for attaching to riding lawn mowers and lawn tractors, Brinly carts carry tools, plants, soil and stone pavers saving time and your back. Brinly carts feature durable galvanized steel frames and heavy duty compression moulded polyethylene beds that won't rust or dent. Unique moulded-in features such as bed channels and stake slots allow for the addition of dividers and extensions. A steep 45 degree tailgate angle and steel release handle mechanism make emptying a breeze. 50-inch 26 cu. ft. Spiral Brush Lawn Sweeper This Professional Grade Lawn Sweeper features an industry leading super capacity 26 cu. ft. heavy-duty collector bag and an extra wide 50 inch sweeping path allowing you to get your lawn care done faster than ever. Exclusive patented spiral brush sweeps more efficiently than standard sweepers and puts less stress on gears for longer life. No-slip positive lock height adjustment will not vibrate out of position and has easy to remember height settings. Hopper easily empties by pulling rope from the seat of your tractor. Just reverse to debris or compost area, pull the rope and you're done. Extra wide 9 inch chute is less likely to clog, especially when sweeping damp grass clippings that clump together. 3-position hitch adjustment allows for efficient level operation with any tractor hitch height without the use of easy to lose spacer rings. 50-inch 26 cu. ft. Spiral Brush Lawn Sweeper is rated 4.2 out of 5 by 80. Rated 5 out of 5 by Julia from Bought this to attach to my mower...works great for picking... Bought this to attach to my mower...works great for picking up leaves & yard brush. Rated 4 out of 5 by MJH from Easy to assemble and setup. Parts and hardware were packaged and labeled the way i would have don... Easy to assemble and setup. Parts and hardware were packaged and labeled the way i would have done it myself. Rated 4 out of 5 by Lawrence from This does a great job of picking up the leaves... This does a great job of picking up the leaves and is easy to use.The instructions could be better for assembly. With the first use I could see that the basket would not hold up very well. Stitches had already started to fail. I covered edges with duct tape for protection that I hope will he. Rated 5 out of 5 by Marlan from It is big , works well unless you fill it... It is big , works well unless you fill it with too much green grass. I would recommend it if you have a large area to pick up. Does this yard sweeper pick up small &amp; large leaves that have been plastered to the lawn surface from snow over winter?